Using a LOMO Captain 14x40 for digiscoping. If you are reading this page, you probably are involved with digiscoping or would like to be. If you already are digiscoping, then this page may be of little interest to you. But if you think you want to digiscope and perhaps are really trying to figure out if you can justify the cost, then read on. I have a Coolpix 995 and a TC-E3ED (3X). I had been taking picture of birds, and found the 3X was too limiting. 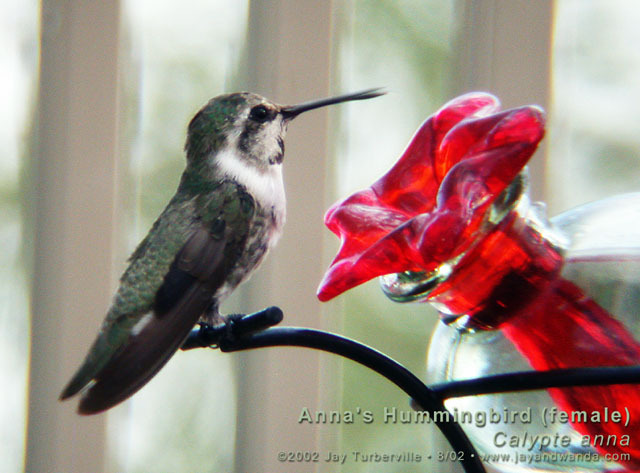 I seriously considered the Kenko and CrystalVue monoculars. But they suffered from mediocre quality and ranged in power from 5X to 8X. When I ran into the concept of digiscoping, I was intrigued. But the cost of even a mediocre scope is pretty high. And the best scopes are quite expensive. So I did more research and came across an interesting little spotting scope called the Captain. It is made by the Russian optical company LOMO . I found it iteresting for two reasons. The first was cost. I got mine for under $60. This is about the cost of an average eyepiece. The second was that it uses mirrors as its primary focusing elements and it is of the Maksutov Gregorian design that does not use any additional erecting prisms. Being a cheap mirror of this design, I was hoping it would suffer less from chromatic aberration than a cheap refractor would. Further down the stats were a few other good things. 17mm eye relief. 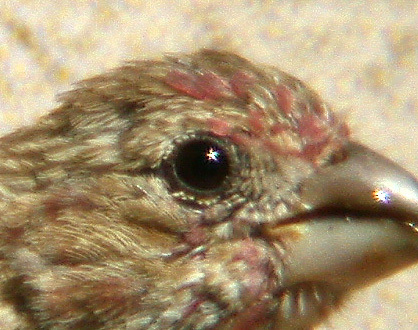 An exit pupil of 2.8mm. 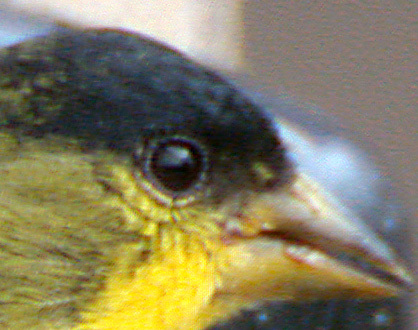 (Visit www.digibird.com for excellent information on optics and digiscoping.) Integrated tripod mount. And did I mention that it was cheap? Of course, there are plenty of negatives. It is a 14x40 scope. You can't change eyepieces and the 40mm aperature is small. The scope is still moderately bright (about average by calculation) since it has a relatively low magnification. But it is cheap. As hopeful as we might be, there is no sense in hoping that a $60 scope will perform like a $1000 optic. 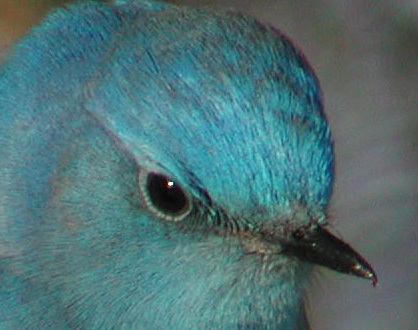 There are two basic approaches to digiscoping. You can handhold a camera to a scope mounted to something very solid (usually a tripod, but maybe a car window mount) and then carefully hold the camera to the scope and snap away. From what I've read, it is important to have a very solid mount for this method. I don't have one, so I used the second method of firmly attaching the camera to the scope. My approach was simple. I affixed a modified 28mm filter ring to the scope's eyepiece using epoxy adhesive. Doing so is pretty simple, but I'll step through how I did it. I did this by inserting a small jeweler's screwdriver between the metal eyepiece and the rubber eyecup and prying a little. I worked my way around the entire eyepiece until I had broken most of the bonding. The eyecup then pops off easily. I set it aside because it looked like I could reattach it later. You need to buy a 28mm filter. I paid $10 for a clear UV filter. I suggest getting one with a metal ring rather than plastic. I also suggest the type that holds the filter glass in from behind with a little metal spring clip. This type has a forward edge that the filter glass is pressed against. 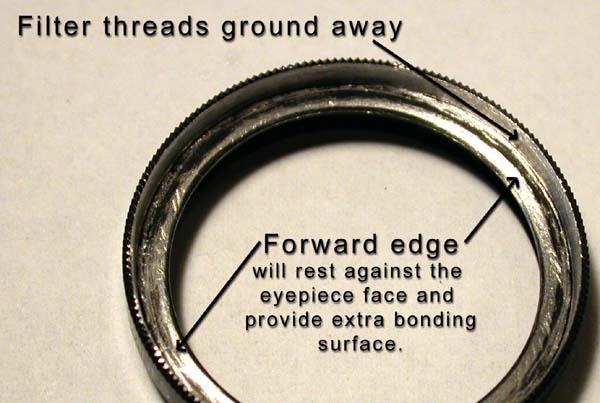 This forward edge will provide extra surface area for bonding to the eyepiece. There is another type where the glass is held in place from the front with a threaded ring. This type might allow the filter ring to be attached about 1mm further forward on the eyepiece (which is probably a good thing), but I'm not sure if it will provide as much surface area for bonding. Using whatever method you have at hand, remove the threads on the forward inner part of the filter (NOT the threads that will be used to attach the filter ring to the camera). I used a variety of Dremel abrasive wheels attached to a drill press. You will need to remove material until the inner ring threads are completely gone - and then remove a little bit more. Once you are sure the threads are gone, test fit the ring to the eyepiece. If it doesn't slide all the way forward until the forward edge (the one that kept the glass filter from popping out the front) is resting on the face of the eyepiece, then remove a little more material. Keep doing this until it fits all the way forward. I STRONGLY ADVISE you to keep your camera and the scope away from the grinding area. Blow or dust off the filter ring thoroughly before test-fitting it. You don't want grit or metal filings near your camera or scope. Now, in contradiction with what I just said, we are going expose the scope to grit by sanding off and roughening up the area of the eyepiece where we will adhere the filter ring. To do so, we must protect the eyepiece. Use either a bit of folded up paper towel or preferrably some cotton and wad up enough to cover and fill the glass eyepiece objective. 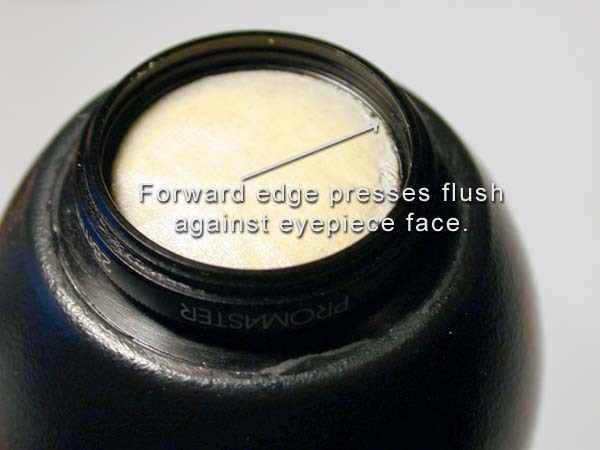 Tape it into place with masking tape and trim the excess around the eyepiece with a razor knife. Place the prepared filter ring on the eyepiece and use a razor blade or sharp knife to scribe a cut along the inner edge of the filter ring. 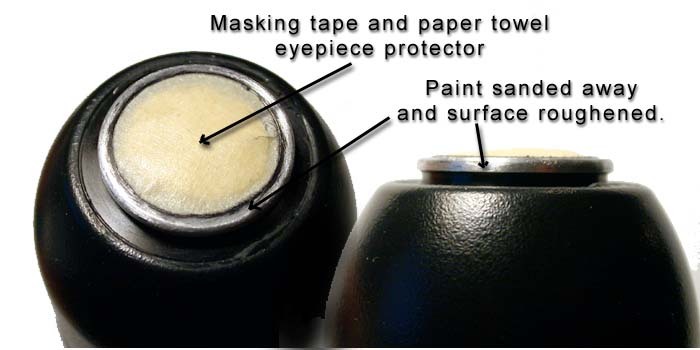 Remove the filter ring, and you should be able to carefully remove a small thin ring of masking tape - leaving the eyepiece covered and protected with a thin circular area of the eyepiece face exposed. Make sure that the scope's lens cap is on. If you want to be extra careful, you could wrap everything except the eyepiece area in plastic wrap until we are finished. I didn't go that far. Its a $60 scope after all. Now carefully sand off the paint around the edge of the eyepiece's lip and the portion of the face that we exposed. I used medium grit emery cloth. Take your time. Be patient. You want a good surface to adhere the filter ring to. When you are done, your scope should look like what I have pictured above. Make sure you thoroughly clean the scope of any residual grit. Screw the prepared filter ring into the camera fairly firmly. Then place the filter ring (still attached to the camera) onto the scope's eyepiece. 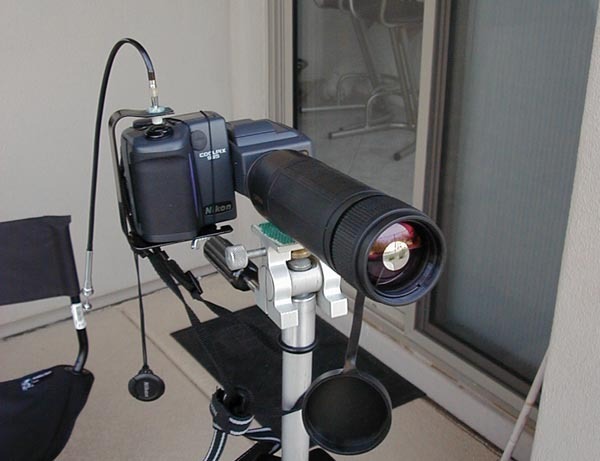 Holding the complete assembly in place, rotate the camera until its flat bottom is parallel to the flat bottom of the scope where the scope mounts to the tripod. Then rotate the camera counterclockwise (from the camera's point of view) about 5 degrees. Make a mark on the filter so that you can place the filter on the scope later with this alignment. It might make sense to put some masking tape on the scope body and mark it to match your alignment mark. We are purposely mounting the filter a little out of alignment since after multiple uses the filter threads will wear a bit and the camera will eventually mount approximately level. I didn't offset mine enough and it sags about 2-3 degrees. This isn't a big deal really and I think I can use some very thin plastic shims to compensate. But you'll want to try to get this as close to correct as possible. Again, take your time. I used a 10 minute epoxy to attach the filter ring to the scope. After mixing the epoxy, spread a layer over all the areas of the scope eyepiece that have been sanded. Use enough so that you can be sure excess glue would be pushed out when the filter ring is pushed on. Push the filter ring on so that it is seated firmly all the way up against the scope's eyepiece. Then carefully removed the excess epoxy with a toothpick. Hold the filter ring firmly in place while doing the epoxy cleanup. You don't want to disturb the bond. Make sure no epoxy gets on the exposed filter threads. If it does, clear it out with a toothpick before it sets. Let the epoxy cure overnight. Then carefully remove the masking tape and cotton protective mask. You really don't have to do this, but it doesn't get in the way for digiscoping and its handy if you simply want to look through the scope. The 28mm filter ring doesn't hinder regular viewing either. Just pop the rubber eyecup over the filter ring and it will stay securely in place. In the morning you'll have a scope that will fit to your 28mm threaded Coolpix. But you'll probably want an LCD screen shade and a cable release before you go shooting. My first CoolPix project was making an eyeshade out of a 2X slide viewer and this is what I use. They cost $2 each. I use the rather popular bent shelf bracket approach to get a cable release working. That should cost about $10 for the cable release and the bracket. My final setup can be seen by clicking on the pictures to the right. So, how well does it work? But all is not lost. Some Photoshop tweaking of levels, sharpening and a chromatic aberration adjustment result in the following image. It still does not match the quality of the Ann Cook image (and never will), but the gap is bridged significantly. So, how well does it work? Part II 08-24-02 Update. I wasn't disapointed with my initial results, but I did think they should be a little better. The image just seemed softer than it should be. So I did some research. The Captain came with a little specifications sheet that shows a resolution of 5" arc seconds or .0013 degrees. A 40mm objective could theoretically yield .000975 degrees of resolution (Again, www.digibird.com will tell you how to do the theoretical calculations). Give LOMO credit for stating a number that seems more "real world" and not just quoting a theoretical limit. The stated resolution should result in 720 lines of resolution in one degree. At full 4x zoom. I estimate my 995 to have a .93 degree horizontal field of view. So it should be able to resolve 670 lines at best. 1340 pixels are needed in order to resolve 670 lines. The 995 has 2048 horizontal pixels so it has the capability to resolve a much higher resolution. Right? So my first step was to simply stop shooting at full resolution. I now shoot at VXGA (1600 horizontal). In fact, the more I think about it, I wonder if it makes sense to shoot all images at VXGA - but thats another project. In addition, I now have the camera set to use maximum contrast and apply maximum sharpness. My hope is that the camera applies these algorithms before the JPEG process. Since this lens is low in contrast and I know I'll have to apply contrast and sharpening at some point, it makes sense to do this before a LOT of information is lost to JPEG compression rather than after. My next two steps employ standard old-school photographic principles. I did some experimental shots and found that sharpness improved if I stopped down to an indicated f8 at 20.2mm. This is about one stop smaller than actual f-stop as calculated from the scope's exit pupil of 2.8mm (effective f-stop of 7.2.) Stopping down further did not improve the image. 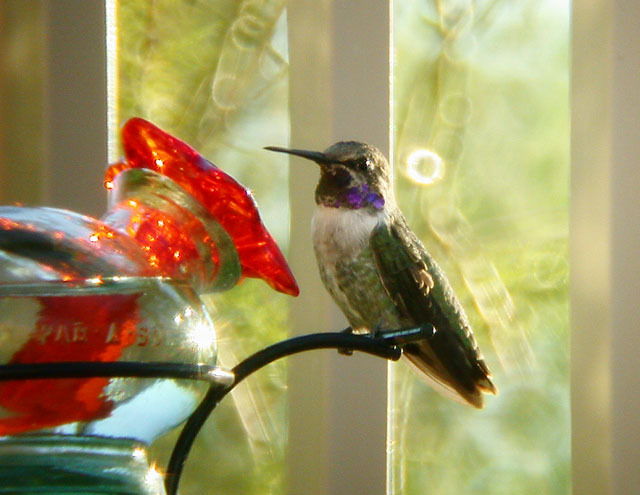 Not only did stopping down one stop improve overall sharpness, but it reduced the chromatic aberations significantly. I then got some PVC pipe and rigged up a 4 3/4" long lens shade that fits snuggly over the end of the Captain. The idea here is to minimize the entrance of stray light into the Captain's optical tube in the hopes of improving contrast. My last step isn't really part of this project. Its in preparation for getting a better scope. I got a decent and sturdy tripod. A new eye image is shown below for comparison. These were taken at VXGA resolution and the cropped image is full resolution. The first image is unaltered. The second is levels adjusted and sharpened by converting to LAB color and performing an Unsharp Mask on only the luminance channel in Photoshop 5.5. Its still not as good as the better scopes and I've lost a stop in speed. And I'm not sure if that funky star specular hightlight will allways look like that. But I am getting an overall better image and I think I'm very close to getting the best possible results from the Captain. I've updated the remaining text to reflect some of my new findings. I may add some new sample images as well. The Captain's image is softer overall unless you stop down one stop. Its edge sharpness is very poor. And most sadly, it can suffer from pretty serious chromatic aberrations near the edge of the image and against very bright backgrounds. Despite its mirror design, the Captain still must use refractive eyepieces and there is at least one other refractive element in the design. The optics simply are not that well corrected. Its a $60 scope after all. However, both of these flaws improve noticably when the 995 is stopped down one stop smaller than the effective f-stop. I haven't done tests to prove it, butI think the new lens shade does improve contrast somewhat. The Captain doesn't gather a lot of light and it gets worse once you stop down. You are stuck with 14X magnification. Since the camera is attached to the scope at all times, lining up on your target can be tricky. Though the LCD viewer helps a lot with aiming the scope. (You might try handholding instead of attaching a filter ring if you have a sturdy tripod.) The scope is not waterproof. And there are, no doubt, other shotcomings that I can't fully appreciate yet. Did I mention that it is cheap? Photoshop (and other image processing applications) can help a lot with some of the image quality issues. With some judicious tweaking of levels, color balance and sharpness controls, you can often quite adequately compensate for a good chunk of the Captain's flaws. (You can correct the chromatic aberrations -assuming you didn't stop down - to a large degree by using Helmut Dersch's Panorama Tools. Or try the mirror site. I use the "Correct" tool, Radial Shift and "d" values of Red=0.996, Green=1 and Blue=1.006. These values correct a huge amount of the fringing near the edges. A more detailed tutorial on correcting optical flaws in Photoshop is at J. Brian Caldwell's site.) The better images make pretty darned decent 5x7 prints. The eye relief of 17mm allows you to use the camera's lens in the 3X to 4X range with only very slight vignetting (only noticeable on even backgrounds like the sky). From 3X down to 2X, vignetting starts to become pretty significant. But again, Mr. Dersch's Panorama Tool has an option that will compensate for the dimness around the edges. I haven't used other scopes, but I find using the collar focusing ring at the end of the Captain to be easy and intuitive - even with the lens shade on. It also focuses as close as 3 meters. It is very smooth in its focusing action. And while I keep referring to this scope as "cheap", it certainly doesn't feel cheap. It is rubber armored and appears to have no plastic parts. Its all metal and feels quite solid. Its also pretty small which makes it very portable. For less than $100 and a little bit of elbow grease, you can have a usable digiscoping setup (assuming you already have the Coolpix camera). You won't have the reach of a 20X-60X Swarovski. Neither will you have its sharpness. But considering that most of the digiscoped images I see on the Yahoo group, "birds-pix" are taken with 20X objectives with a 2X-3X camera setting and that Photoshop can help some of the sharpness problems, this isn't that horribly limiting. 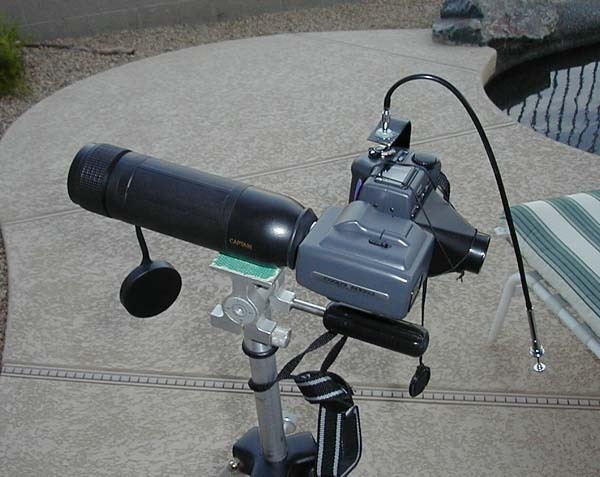 This scope mounted to a Coolpix 995 or a Coolpix 4500 covers the lower magnification range that a lot of digiscoped images are taken in. At a 4X camera zoom, this scope has about the same magnification as a 2100mm 35mm camera lens. That's not bad. 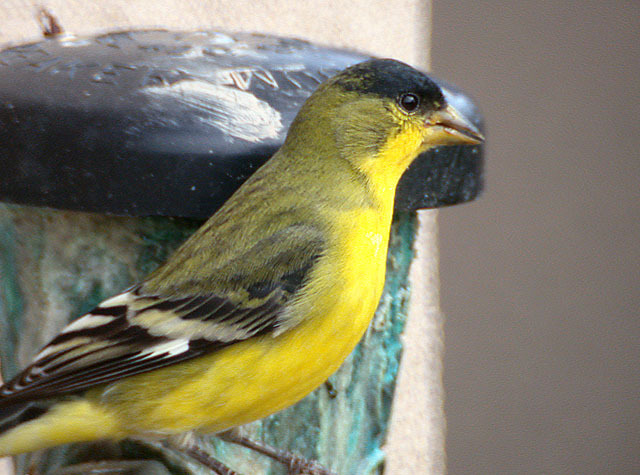 This is a nice way to experiment and actually do some digiscoping without breaking the bank. (There are eyepieces that cost four times the price of this entire scope.) You'll learn about the importance of having the camera steady. You'll experience the difference a cable release makes. If you live in the Southwestern United States, you might notice that a Saguaro actually does move noticably in a breeze. 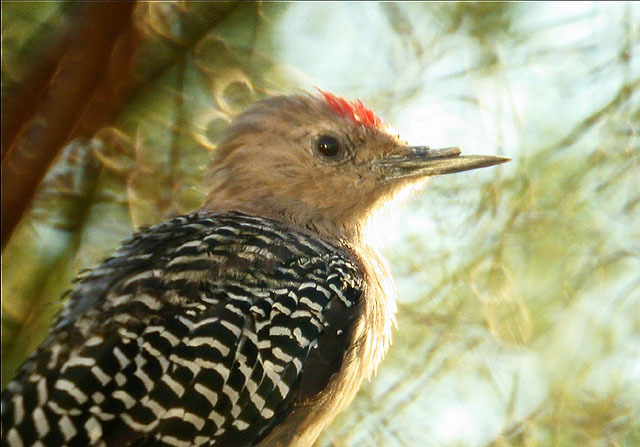 You'll discover that patience and perseverence are very important to digiscoping. And depending on your personal desires (and pocketbook size), this scope may be a very well be all you need for digiscoping. Or, as in my case, it can provide an inexpensive tool with which to explore the depth of your interest. I will almost surely be looking for a scope with more reach. However, I consider the money well spent and I am quite pleased with my very cheap scope. These images were taken with the modified Captain scope. Click on the thumbnails for a web-sized photo. All images have been altered in Photoshop 5.5 as described above. I have included text links to the original, rull resolution, unaltered images below the corresponding thumbnail images so that people can reasonably evaluate the Captain's performance for themselves. You might try tweaking these images yourself. I may even post full resolution "corrected" images at a later date. These images were taken with the modified Captain scope using my newer techniques and settings. Click on the thumbnails for a web-sized photo. All images have been altered in Photoshop 5.5 as described above. I have included text links to the original, rull resolution, unaltered images below the corresponding thumbnail images so that people can reasonably evaluate the Captain's performance for themselves. I purchased my scope (and more recently a LOMO Astele 95) from Optics Planet. I'd love to recommend them whole-heartedly, but my experience has been mixed. The folks at Optics Planet seem to be an honest but sometimes disorganized group. I've had the wrong scope shipped and I received an eyepiece that was defective. It took around three weeks for them to get a replacement eyepiece to me. But they have never argued when I have pointed out the problems and they have made ammends. For instance, they included a 25mm Plossl eyepiece at no charge when they finally overnighted the replacement zoom eyepiece to me. Their prices are low as well. So while I feel confident that they are reputable, you shouldn't be surprised if things don't go entirely smoothly. My only affiliation with Optics Planet and LOMO is that I am a customer.